I was going through some pictures from my mother-in-law's camera and found these photos of some bonding between Taylor and her PawPaw. In this picture Taylor was talking to him and Dad swears that she smiled at him. 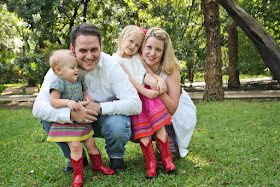 Doesn't she know that Mommy and Daddy are supposed to be the first ones to see her smile? After a little while we looked over and saw the picture below. 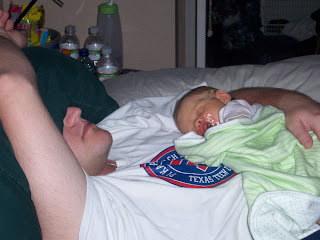 I think Dad found a new nap buddy! 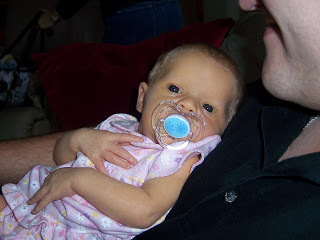 I can't believe that Taylor is already 5 weeks old today. Time is already going by really fast and I only have 2 more weeks at home with her. I am really going to miss our daily adventures, but only a few weeks back to work and we get to spend another month at home together. Here are some pictures of our adventures today. I never thought I would have so much fun entertaining a one month old. 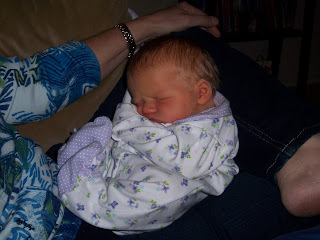 After a little bit she got REALLY relaxed in her Boppy pillow nap. Lunchtime nap in our new swing. Like my bear ears? 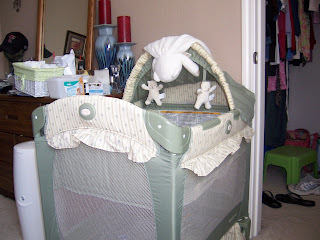 Afternoon nap actually in the bassinet. Our dear child loves to fall asleep to cricket noises, but if it works I'm happy. It may seem like she sleeps all day, but it's really hard to get a picture of her while I'm holding her or playing with her while she's awake. 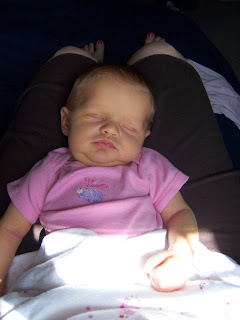 Plus I figured in a few years I would enjoy seeing pictures of when she would take more than one nap a day. Okay, so Chris is home and keeping Taylor content so that I can post some Taylor pictures on here. I know this is a lot of pictures, but she is now 3 weeks old and I've only done one posting of pictures. I have to catch up a little. 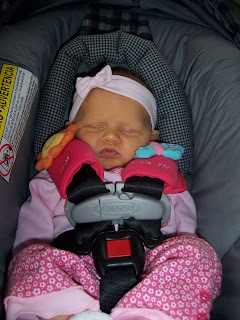 This is a picture of the day Taylor came home from the hospital. She loves to sleep all curled up in a ball like this. 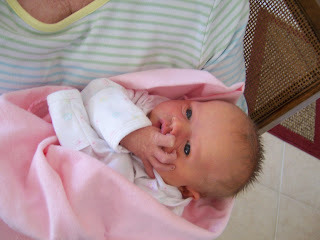 On her second day home, she discovered her thumb and started sucking on it. Check out the sticky-upy hair. Thank you for the cute outfit Misty! 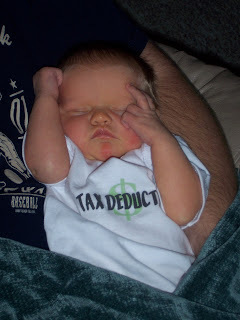 This is of our first trip that was not to the doctor's office. I think I was more excited than she was to get out of the house! Working on our sun time. 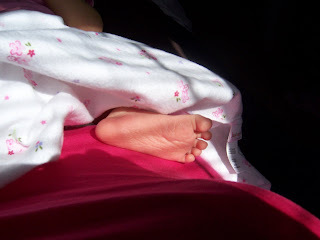 I just love her feet! gives me a few minutes to brush my teeth or pee. Our first full bath on 4/28. She did not like it very much. 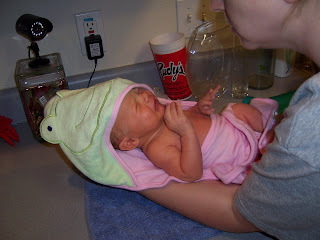 She just looked too cute in her froggy bath towel after her bath. 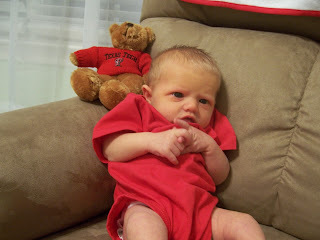 Our first attempt at a picture in her Texas Tech outfit. It's still a little big for her!